Remember Kate Middleton's sapphire blue Issa engagement dress? SIGH. It matched her sapphire and diamond engagement ring (originally Princess Di's) and was princessy perfection. About five minutes after the photo hit the public, knock-offs of the dress mushroomed across the country world to the delight of fashionistas everywhere. But the best dress was yet to come: Introducing the Issa maternity dress! Oh pregnant ladies. Are you sitting down? Sit down. Brace yourself. This dress retails for £522.00. Which means, according to current currency exchange rates, $821.24. Factor in shipping costs and you're looking at a dress that'll set you back about $900. That's almost A TOUZUND DOLLAHZ! You'd better plan on having six babies and wearing this dress every single day of those pregnancies in order to justify that. Or maybe you could do this -- buy the dress now, and then sell it after you have the baby and use the proceeds to cover your hospital bills. And it's "dry clean only." Great, so now you have to spend even more money cleaning off all the cheese doodle dust and chocolate fudge syrup you'll probably spill on it. 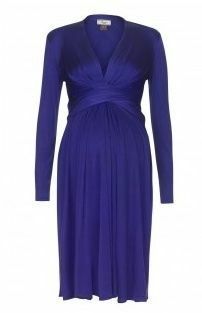 Who makes a "dry clean only" maternity dress? Do they not understand how pregnancy works? But don't give up, expecting moms! No great idea goes unexploited for long. I'm sure as we speak, someone at H&M or Target is whipping up the design for the exact same maternity dress. And it'll retail for $39.99 and be machine-washable, too! Would you buy a cheaper, machine-washable version of this dress?